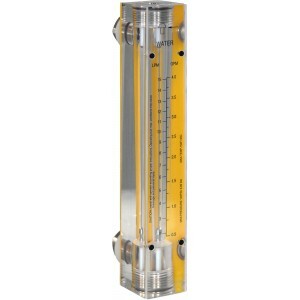 Dakota Instruments’ Acrylic Meters offer solid, one-piece meters with a clear-as-glass finish, English or Metric scales, good accuracy and repeatability, and economical prices. Designed to measure routine gases, these meters are equipped with interchangeable easy-to-read scales. Models are equipped with a yellow colored backing or white back reflector to enhance readability and help minimize eye fatigue. 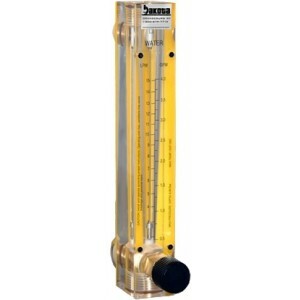 Available for multiple flow rates, this Acrylic Flow Meter has a Dual Direct Reading Scale with yellow backing for easy viewing of Water flow values. Viton Seals, 1/8" FNPT and Stainless Steel End fittings are standard. The float material varies based on the metering range (316 SS, Carboloy, Glass). Available for metering flow rates from 20 mL/min (0.3 GPH) to 1400 mL/min (22 GPH). 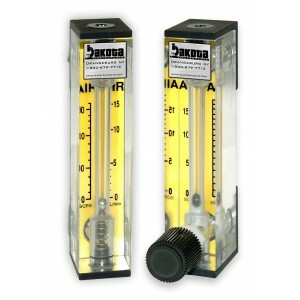 This Acrylic Flow Meter has a Dual Direct Reading Scale with yellow backing for easy viewing of Nitrogen flow values. Viton® Seals, 3/8" FNPT and Brass End fittings are standard. The float/guide material is 316 Stainless Steel. 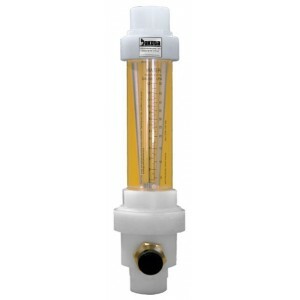 This Flow Meter is designed for panel mounting and can handle a Maximum Flow Rate of 575 LPM (21 SCFM). No Valve. 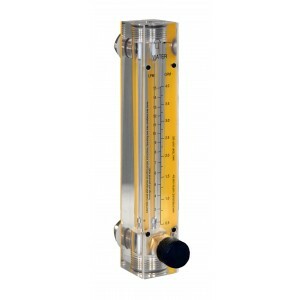 This Acrylic Flow Meter with Valve has a Dual Direct Reading Scale with yellow backing for easy viewing of Nitrogen flow values. Viton® Seals, 3/8" FNPT and Brass End fittings are standard. The float/guide material is 316 Stainless Steel. This Flow Meter is designed for panel mounting and can handle a Maximum Flow Rate of 575 LPM (21 SCFM). 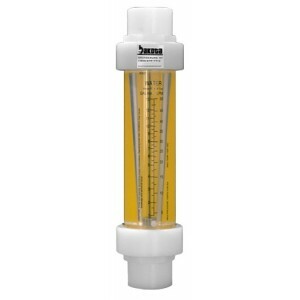 This Acrylic Flowmeter has a Dual Direct Reading Scale with yellow backing for easy viewing of Nitrogen flow values. Viton® Seals, 3/4" FNPT and Polypropylene End fittings are standard. The float/guide material is 316 Stainless Steel. This Flowmeter is designed for inline mounting and can handle a Maximum Flow Rate of 2200 LPM (77.5 SCFM). No Valve. 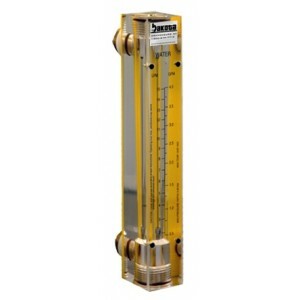 This Acrylic Flowmeter with Valve has a Dual Direct Reading Scale with yellow backing for easy viewing of Nitrogen flow values. Viton® Seals, 3/4" FNPT and Polypropylene End fittings are standard. The float/guide material is 316 Stainless Steel. This Flowmeter is designed for inline mounting and can handle a Maximum Flow Rate of 2200 LPM (77.5 SCFM).